Over the weekend, mom bought a huge packet of South African cherries (I didn’t know S.A produces cherries! ), and they were big and juicy! Hence the inspiration was from the sweet cherries. I recently collected this Essie nail polish in Blanc, and I am quite pleased that it’s opaque and not as streaky as any other white! I have had a few Essie polishes in pastel colors, but I find that they are too sheer and the brush just worsens the application. However, 2 coats are needed to achieve the full opacity. For the accent nail, it is the new Dior from Summer Mix collection, the shade is Calypso and it’s a bright red with jelly finish. The application is almost fool-proof with the excellent formula and brush, and it dries pretty fast. 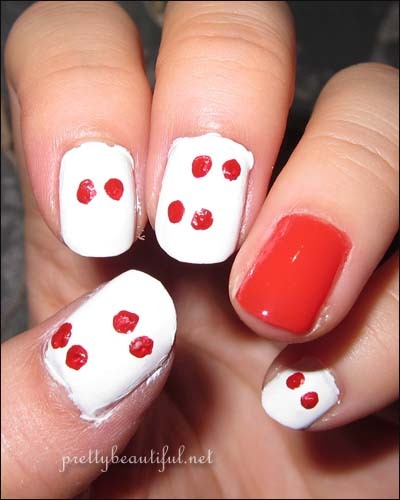 With a dotting tool, pick up some red acrylic paint or polish and make some dots which will resemble cherries. When it’s dried, use a green polish/acrylic paint and create strokes to look like the stems. For the accent nail, use the dotting tool again to pick up white polish for the polka dots. I find that it’s easier to work with polishes for polka-dotting rather than the acrylic paint. The polish will dry to a smooth surface while the acrylic paint tends to leave bumps on your nails if it’s too thick. And cherry nail art against the huge cherries! On my toes, I have Lagoon from Dior Summer Mix Collection. All it takes is just one layer! Another picture of my ‘cherry blossom’ on both hands. 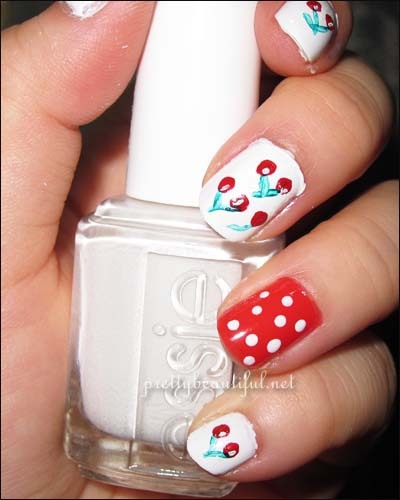 This is a pretty easy nail art, and as long as you are able to create some dots and lines, you will able to wing this! Do you love cherries? I do! Cherry nails are toooooooooo cute!!! 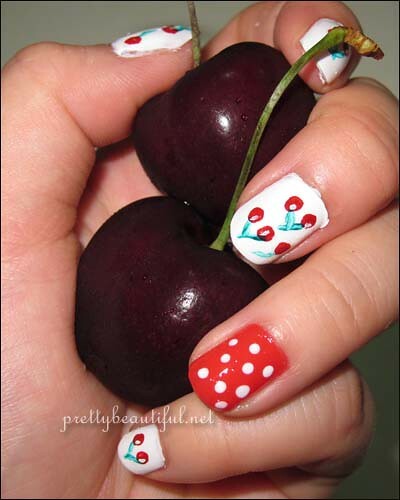 This is the best cherries nail art I have came across! That’s so pretty and, I agree with Plue, very vintage too! You did a great job!